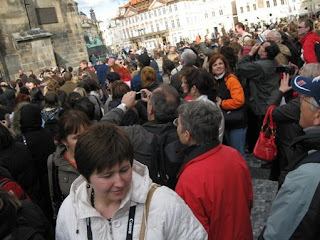 We Are The World: Prague: Ze clock, she is goink to do something, no? 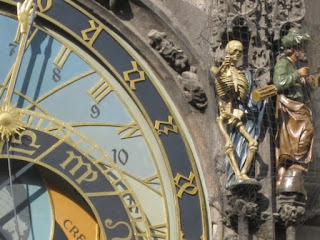 Prague: Ze clock, she is goink to do something, no? I had been wandering around the Old Town Hall, Prague, by myself. I had just come down from the clock tower and filed into Starbucks behind Gustav. The clerks were asking for names to put on beverages and were struggling with the foreign names. Gustav had to write his own. So I took it easy on them and said my name was Star. With my beverage in hand, I walked out into said mob and realized something big was going down. It was 5 minutes til 2. People began pointing to the clock and counting down. I remembered a time similar to this at Carowinds when I got in a mob of people pointing and gazing upward, only to find a huge bucket of water dumped on my head, so I was a bit reluctant, I wasn't gonna fall for that again. Then I saw the fake person ringing the bell was a skeleton. (see bottom photo) Dude. These Praguians have a weird sense of humor. 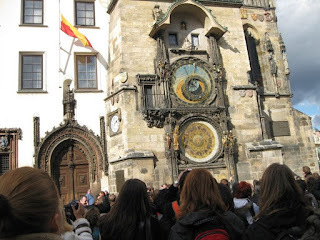 Earlier, I went up the astronomical clock to get a great view of the city. 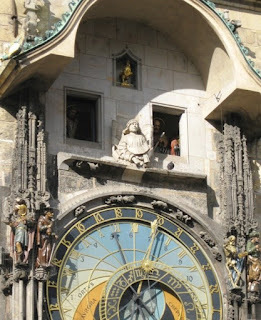 The clock was mounted on the southside of the Town Hall watch tower in 1410. I don't really understand the whole astronomy thing, never my strong suit, so I'll quote: "it's based on the geocentric conception of the planet motions and representing the chronology methods of that time." It was "destroyed and rebuilt in '45 during the Prague May Rising" and "the lift for handicapped persons was mounted in the late 1990's. Ooops. That was for handicapped persons?? Just what kind of handicap do you have if you rode the lift? Mental, physical, or both. Glad to see that there is a Starbucks in Germany. Don't know how you would have survided without it. FINALLY a Starbucks how HAVE you survived this past week?! Pics are incredible.